NGC 7380 (also known as the Wizard Nebula) is an open cluster discovered by Caroline Herschel in 1787. William Herschel included his sister's discovery in his catalog, and labeled it H VIII.77. It is also known as 142 in the 1959 Sharpless catalog (Sh2-142). This reasonably large nebula is located in Cepheus. It is extremely difficult to observe visually, usually requiring very dark skies and an O-III filter. Taken with a PlaneWave CDK 700 with exposure times as follows: Lum-120min, Red-120min, Green-120min, Blue-120min, S2-200min, O3-200min, HA-200min. NGC 3576 is a minor nebula in the Sagittarius arm of the galaxy a few thousand light-years away from the Eta Carinae nebula. This nebula even received six different classification numbers. Currently, astronomers call the entire nebula NGC 3576. A popular nickname is "The Statue of Liberty Nebula" because of the distinctive shape in the middle of the nebula. The name was first suggested in 2009 by Dr. Steve Mazlin, a member of Star Shadows Remote Observatory (SSRO). Explanation: An intriguing and beautiful nebula, NGC 3576 drifts through the Sagittarius arm of our spiral Milky Way Galaxy. Within the region, episodes of star formation are thought to contribute to the complex and suggestive shapes. Powerful winds from the nebula's embedded, young, massive stars shape the looping filaments. The dramatic false-color image also highlights the contributions of hydrogen, sulfur, and oxygen, energized by intense ultraviolet radiation, to the nebular glow. But the glow also silhouettes dense clouds of dust and gas. For example, the two condensing dark clouds near the top of the picture offer potential sites for the formation of new stars. NGC 3576 itself is about 100 light-years across and 9,000 light-years away in the southern constellation of Carina, not far on the sky from the famous Eta Carinae Nebula. "Like a cosmic flower, Hubble's Variable Nebula is a lovely reflection that appears to sprout from the bright star R Monocerotis. Otherwise catalogued as NGC 2261 by the astronomer John Louis Emil Dreyer in 1888 in his iconic New General Catalogue, this nebula was discovered in 1783 by William Herschel. It is also famous for the being the first deep sky object to have been photographed with the Hale Telescope at the Palomar Observatory in 1949 by none other than Edwin Hubble. The popular name of this nebula arises from it being studied by Edwin Hubble in 1916 who noticed it changed in brightness. It is now known that its dramatic and quite quick changes in brightness and appearance are the result of opaque clouds of dust situated between the star and the nebula. The appearance of NGC 2261 has been observed to change on timescales of a few months if not a few days! The reddish nebulosity visible to the north of NGC 2261 is an example of a Herbig Haro object, a type of jet ejected by a young star that glows by the energy generated by the gas colliding with its surrounding space. They were originally independently discovered by the astronomers George Herbig and Guillermo Haro. This Herbig Haro object is catalogued as HH 39 and more than a thousand are currently known. An analysis of the proper motion of the knots in HH 39 show that it is moving away from R Monocerotis and NGC 2261." LRGBHa 300,180,180,180,450 Taken with a PlaneWave 24" CDK from Animas New Mexico. IC 348 (also known as IC 1985) is a 2 million year old open star cluster surrounded by a reflection nebula of about 15 light-years across, located some 1028 light-years away from Earth in the northern constellation of Perseus, while it is receding from us at 14 kilometers per second. It is embedded in the star-forming region called the Perseus molecular cloud. The light from the roughly 400 stars in the cluster is scattered by clouds of dust in the star-forming region, producing the reflection nebula. The cluster’s brightest members are hot, bright bluish Main Sequence stars, but some stars are still in the process of formation, so star formation is an ongoing process in the region. The most massive stars in the cluster are the stars of the binary star system called BD+31°643. About half of the stars in the cluster have a circumstellar disk, of which 60% are primordial disks, where planets could be forming. Studies of circumstellar disks in clusters of various ages are expected to yield a better understanding of the dynamics of planet formation. Inside this extremely young cluster are also about thirty brown dwarfs discovered, with masses as low as 15 to 80 times that of Jupiter, as well as three brown dwarfs with estimated masses of less than 10 times that of Jupiter. Brown dwarfs lose heat as they age, so they are more readily discovered while they are still young. Current models estimate that their surfaces are approximately 900-1000 degrees Kelvin (about 600-700 degrees Celsius). That’s extremely cool for objects that have just formed, which implies that they have the lowest masses of any of this type of object that we’ve seen to date. The discovery of the dwarfs in IC 348 has allowed astronomers to set new limits on the lowest mass objects. Recently, astronomers discovered an unusual variable object inside IC 348 that appears to be a close binary pair of protostars, named LRLL 54361 (L54361 for short). This bright object emits flashes of light every 25.34 days. These two protostars drag material inwards from a surrounding disk of gas and dust. The light flashes are probably due to this material suddenly being dumped onto the growing stars as they near one another in their orbits, unleashing a blast of radiation. This is only the third time this phenomenon has been observed, and it is the most powerful such beacon seen to date. It is also the first to be seen associated with a light echo. Flashing double star systems like this one are rare, because close binaries account for only a few percent of our galaxy’s stellar population. Moreover, the pulsing light is likely to be a brief phenomenon in the early life of a star. NGC 654 is a brilliant colorful open cluster in the constellation Cassiopeia. It was discovered by William Herschel in 1787. Here is a great paper " from 1960 "Yerkes Observatory" not far from my home here in Madison, Wi. This deep image shows many more features of this area. The dark serpent shaped area seemingly getting ready to strike the open cluster NGC 654 are "Lynds Dark Nebula" or LDN objects. These were objects cataloged by Beverly T Lynds in 1962 called "Catalogue of Dark Nebula". Here we have three LDN objects 1332,1334,1337. Also, TGU H855 P2 another dark nebula. Next to NGC 654 we have VDB 6 a faint blue reflection nebula. VDB objects are 158 reflection nebulae cataloged by astronomer Sidney Van Den Bergh. Spanning an area of 35 arcminutes on the sky towards the constellation of Cassiopeia, this enigmatic loop of ionized nebulosity is a supernova remnant catalogued as CTB 1. This name denotes it as a radio source compiled in the Caltech Observatory list B catalogue of 110 radio sources discovered in a radio survey in 1960. A few other CTB sources also correspond with a supernova remnant such as CTB 80. The radio source CTB 1 was suspected to be a supernova remnant in 1960 and confirmed as a supernova remnant in 1971. Optical emission associated with it was discovered by Sidney van den Bergh in 1973. The optical structure consists of a roughly circular shell with a breakout rupture towards the north, which also coincides with a break in the radio shell at this location. This is likely to be the result of the supernova remnant's interaction with a nearby cavity of neutral hydrogen gas. The Ha shell is composed of multiple interlocking limb brightened filaments with faint emission also extending beyond the main shell towards the south. The OIII structure consists of a series of filaments forming a curved arc towards one side. Close inspection also reveals a small dark globule silhouetted against the southern part. CTB 1 belongs to the morphological class of mixed-morphology supernova remnants, which consist of a radio shell with central x-ray emission. Other prominent examples of this class include IC 443 and W28. At a distance of 10,000 light years, the diameter of CTB 1 is 100 light years. The expansion of the shell in a highly dynamic environment suggests that the progenitor star that exploded to form the supernova remnant might have been a B or O-type supergiant star. The age of CTB 1 has many estimates but the most commonly accepted one is 10,000 years. Interestingly this object has been considered erroneously as a planetary nebula and is catalogued as Abell 85 in George Abell's second version of the Abell planetary nebula catalogue published in 1966 and was also included in the first version published in 1955. It is also wrongly catalogued as a HII region in Beverley Lynd's amusingly named 1965 catalogue of bright nebulae as LBN 576. "IC 1871 and SFO11 deep within the Soul Nebula"
"Zooming in on the northeastern part of the Soul Nebula, this image shows a few groups of bright rimmed globules that are collectively catalogued as IC 1871 (right) and SFO 12 (left). Their gaseous forms are sculpted by the UV radiation and stellar winds from many hot young stars in the star cluster associated with the Soul Nebula. The term "bright rimmed" arises from the side of the globules that are facing the ionzing source exhibiting bright rims as a result of the gas and dust becoming more compressed and denser and therefore brighter than the surrounding material. In the case of IC 1871 and SFO 12, they point towards the cluster situated West of them (not visible in image). IC stands for "Index Catalog" and was the first major update to the NGC "New General Catalog"
Taken with a Planewave 24" and 17” f6.7 on a Planewave HD Mount and a SBIG 16803 camera. Imaged from "Dark Sky New Mexico" in Animas. This large amazing rich open cluster with more than a hundred stars! Is embedded in an area of abundant emission nebulosity. The area around it also includes the elongated dark nebula LDN 885, the round DSH planetary nebula Patchick 6, which was discovered by the DSH member Dana Patchick and another open cluster SAC Do 2. "A small but enchanting denizen of the Milky Way, Sh2-82 is a beautiful cloud of gas and dust consisting of an emission nebula enveloped by a hazy reflection nebula. It is embedded in the dark nebula LDN 727 and is the site of some star formation and young stellar objects (YSO). Located at a distance of approximately 3600 light years, Sh2-82 is ionized by the star HD 231616, which can be seen near the centre." NGC 7538, near the more famous Bubble Nebula, is located in the constellation Cepheus. It is located about 9,100 light-years from Earth. It is home to the biggest yet discovered protostar which is about 300 times the size of the Solar System. Telescope: Planewave 17" f6.7 on a Planewave HD Mount. Camera: SBIG 16803 Exposure: 300 min Luminance, 300 of each RGB, 500 min HA, 300 min S2 and, 1000 min O3. One of the most notable clusters within NGC 2467, known as Haffner 18, houses around 50 stars—most are high-mass, but have already begun the transit into the celestial afterlife. They certainly help shape the pillars of gas and dust, but their role is negligible compared to that of HD 6315 located in the center of NGC 2467. This gargantuan star does most of the work. Its outbursts, ranging from flares, to coronal mass ejections and such, eject vast quantities of radiation into the nebular material, which has a carving effect. The dark splotches all around and in the nebula are Bok Globules. Within these regions, dust is packed together so tightly, light from embedded stars can’t break through. You can see many of the bright rimmed globules clearly, these are the result of UV radiation and winds from hot young stars that have had an effect on the gas around them. Sometimes I wonder what the nebula the Sun was born in would have looked like? SFO stands for "Sugitani, Fukui and Ogura", the surnames of three Japanese astronomers who compiled the SFO catalogue of bright rimmed globules in HII regions. It was published in 1991 (northern hemisphere) and 1994 (southern hemisphere) by Koji Sugitani, Yasuo Fukui and Katsuo Ogura and has 89 in total. For no particular reason it isn't well known outside the professional community. "The Lost Pillar of Creation"
Most know of the "Pillars of Creation,” which is a famous image from the Hubble Space Telescope, but few know of this hidden pillar. What a gem! This “no name” pillar is all alone in the dark shadows of the Heart and Soul Nebula. In between open cluster NGC 1024 and IC 1805, the pillar itself looks like a finger pointing to the wonderful Melotte 15 Nebula at the center of IC 1805. A beautiful, but quite faint object. It needs long Ha exposures to really make it pop out. Although very photogenic and well placed for northern observers these two objects are rarely imaged: LBN 762 / MBM13 dubbed the Drunken Dragon Nebula can be seen in this image. This field is located in Aries just south of MBM12.This relatively young association of gas and dust is home to an early stellar nursery and a few newborn stars . Once believed to be the nearest dust cloud from our solar system it is now suggested to be about 850 light-years away.The structure of LBN 762 is quite amazing, one must wonder what forces are at play to create such intricate features. Numerous background galaxies are visible, some even through relatively dense part of the translucent clouds. These cosmic clouds have blossomed 1,300 light-years away, in the fertile starfields of the constellation Cepheus. Called the Iris Nebula, NGC 7023 is not the only nebula to evoke the imagery of flowers, though. Still, this deep telescopic image shows off the Iris Nebula's range of colors and symmetries, embedded in surrounding fields of interstellar dust. Within the Iris itself, dusty nebular material surrounds a hot, young star. The dominant color of the brighter reflection nebula is blue, characteristic of dust grains reflecting starlight. Central filaments of the reflection nebula glow with a faint reddish photoluminesence as some dust grains effectively convert the star's invisible ultraviolet radiation to visible red light. Infrared observations indicate that this nebula contains complex carbon molecules known as PAHs. The pretty blue petals of the Iris Nebula span about six light-years. The colorful field-of-view stretches almost five Full Moons across the sky. Simeis 3-210 is a long, thin filament at the extreme southern end of the Veil Nebula and is virtually unknown (not listed separately in SIMBAD), although it is outlined on the U2000 and Millennium star atlases. Although much fainter than the other main sections of the Veil, Simeis 3-210 was easily picked up at 105x using an OIII filter as it passes through mag 6.4 HD 198976. This narrow strand is extended N-S at least 20' with the northern half mainly consisting of an elongated patch (~3'x1'), centered about 6' NNE of the bright star. The southern section is a very dim filament beginning at the mag 6.4 star though it brightens somewhat ~10' SSW of the star. There also appears to be some streaky, detached nebulosity just west of a mag 7.7 star further south, extending the total length to 25'-30'. Ten thousand years ago, before the dawn of recorded human history, a new light would have suddenly have appeared in the night sky and faded after a few weeks. Today we know this light was from a supernova, or exploding star, and record the expanding debris cloud as the Veil Nebula, a supernova remnant. This sharp telescopic view is centered on a western segment of the Veil Nebula cataloged as NGC 6960 but less formally known as the Witch's Broom Nebula. Blasted out in the cataclysmic explosion, the interstellar shock wave plows through space sweeping up and exciting interstellar material. Imaged with narrow band filters, the glowing filaments are like long ripples in a sheet seen almost edge on, remarkably well separated into atomic hydrogen (red) and oxygen (blue-green) gas. The complete supernova remnant lies about 1400 light-years away towards the constellation Cygnus. This Witch's Broom actually spans about 35 light-years. The bright star in the frame is 52 Cygni, visible with the unaided eye from a dark location but unrelated to the ancient supernova remnant. Cosmic dust clouds sprawl across a rich field of stars in this sweeping telescopic vista near the northern boundary of Corona Australis, the Southern Crown. Less than 500 light-years away the dust clouds effectively block light from more distant background stars in the Milky Way. The entire frame spans about 2 degrees or over 15 light-years at the clouds' estimated distance. Near center is a group of lovely reflection nebulae cataloged as NGC 6726, 6727, 6729, and IC 4812. A characteristic blue color is produced as light from hot stars is reflected by the cosmic dust. The dust also obscures from view stars in the region still in the process of formation. Smaller yellowish nebula NGC 6729 surrounds young variable star R Coronae Australis. Below it are arcs and loops identified as Herbig Haro objects associated with energetic newborn stars. Magnificent globular star cluster NGC 6723 is at the right. 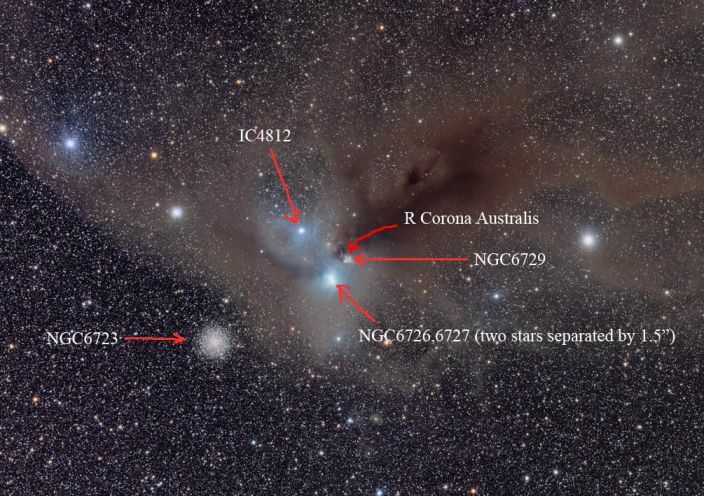 Though NGC 6723 appears to be part of the group, its ancient stars actually lie nearly 30,000 light-years away, far beyond the young stars of the Corona Australis dust clouds.